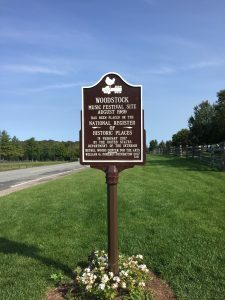 This is the last installment recounting my series of heart encounters on September 10 and 11, 2017 in connection with a pilgrimage I made to the site of the original Woodstock festival. This post covers Monday, September 11. Read Part 1 and Part 2 here. Monday morning. The day would end with my sleeping in my own bed. I’d only been away for 4 days but it felt longer and for good reasons: the Woman Within weekend had left me with the usual glow. I’d driven roads I’d never been on before. I’d expected miracles and they’d obligingly happened. And I still had the day ahead of me. I was going to complete my pilgrimage to the Woodstock site. All of my mes were excited: the 8-year-old me who’d heard about the festival on the news the weekend it happened, the same weekend she and her family moved into their new house in Shaker Heights, Ohio, and while waiting for the furniture truck to arrive camped out in the living room in sleeping bags, “just like those kids at that big concert in New York!” The teen me who saw the movie and envied “the kids” both the show they saw and the peaceful sense of belonging they shared. The 30-something me who felt too old and too uncool to be part of Woodstocks 2 and 3. The present-day me who finally feels a sense of belonging in the world and who, especially after the previous day’s visit to Big Pink, wasn’t ashamed to want to occupy space and breathe the air at iconic sites. The universe had a lagniappe for me. I’d booked a room at the Days Inn in Liberty because it’d showed up on the list of “hotels near the Museum at Bethel Woods” for about what I was willing to spend on a reasonably clean room and it didn’t have unnecessary frills I’d be too tired to enjoy. I didn’t know until the night I was there that the town of Liberty was where Grossinger’s was. And I didn’t know until after I got back home that in 1969 that Days Inn (then a Holiday Inn) had been where many of the Woodstock performers had stayed. I’d read in a book about the event that they’d turned the lobby into a stage for a massive jam session. Had I known where I was, I’d’ve taken a moment to sit in the lobby and imagine what a sight and sound that must have been. I checked out of the hotel around 9:30am, filled my travel mug with free coffee in the lobby (while unknowingly bumping into the ghost of Jimi Hendrix?) then headed down Route 17. At Monticello I turned right onto Route 17B, which would take me the last 10 miles to my destination. As I drove I realized that I hadn’t been in anything other than a small town since leaving DC on Thursday. The largest commercial area with national chains I had seen was in tiny Liberty. I only saw mom-and-pop businesses along 17B, and those were sparsely scattered. A cafe. An insurance agency. A farm equipment dealer. I pictured the road as it had been that August weekend in 1969, choked with abandoned cars and hordes of people on foot, heading toward Yasgur’s farm. The day I drove Route 17B into Bethel I had the road pretty much to myself. At last my last turn came up on the right. Hurd Road. I turned onto the tree-lined country road that looked as if it must have in 1969, except for the road sign that invited me to “Please Drive Peacefully.” A ways up, signs appeared for The Museum at Bethel Woods, as the site is known now. Parking lots to the left, on what back then had been cornfields. The modern-day concert pavilion was to the right, although not visible from the road. Then the museum itself was on the right. I turned into the parking lot directly across Hurd Road from the museum entrance, shortly before 10 am, which is when the museum opened. There were only a half-dozen cars there already, not surprising for a weekday during the off season: Labor Day had been the week before. In fact, I had counted on a lack of crowd. It was a gorgeous morning, clear, cool, cloudless and peaceful. Very like the weather on another September 11, the one in 2001. Being in a place so closely identified with peace and love on such a day felt right. For a site known for the record number of people to inhabit it all in one time, it was a little eerie to find it so empty. Nonetheless, the introvert side of me was glad that I’d be able to explore the space on my own terms rather than being herded through like one of Max’s cows. My first stop was the museum, which is similar in spirit and execution to the Rock & Roll Hall of Fame. Multimedia exhibits and well-curated displays give a sense of the time and culture surrounding the festival. The bits that I was most taken by were the actual artifacts: staff t-shirts and jackets decorated with the iconic bird-on-guitar-neck logo, a psychedelic bus that you could board, correspondence surrounding the mammoth logistics to make the festival happen in the first place. No internet back then: it all came together over the phone, telegram and mail. I signed the guest book with a message of love and compassion, then exited through the gift shop. Next up, I wanted to step foot on The Field. The museum brochure had a little map showing where it was. I followed it to the far end of the parking lot and looked over a field that didn’t quite match up with what the brochure showed. 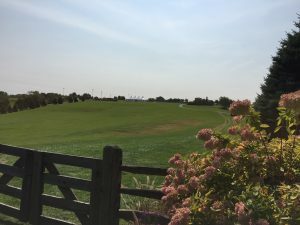 Whether or not it was the actual field where the music happened and thousands listened, I was sure that at the time of the festival it saw some foot traffic. The next and final stop was the monument at the corner of Hurd Road and West Shore Road. I parked in the tiny lot and walked through a stand of hedges. A helpful sign explained the site layout better than the museum brochure had. The actual audience field was just beyond the monument and the stage had been to the left. THIS was what I’d come to see. The empty field in front of me that had held a then-record 400,000 people in 1969 and looked so ginormous in pictures of the event seemed so… small. The natural bowl that had contained a stage with so much talent playing so much good music so loud seemed so… quiet. The site that had been declared a disaster area was so… peaceful. And I was… there. Fences blocked off the field proper from foot traffic but there was an open area with picnic tables and a “message tree” that gave a sense of community. I added my name to the hundred on the table tops with one of the several Sharpies that were there and wandered over to the message tree. I reached into my pocket for a heart to leave. I thought “red,” the color of the Woodstock posters, and a red heart appeared in my hand. Yep, miracles. It was nearly noon. I’d been at the Bethel Woods site for 2 hours and had to think about heading to the highway back to DC. I’d gotten the experience I was looking for. I took one last look around and headed back toward the parking lot. “Excuse me. Were you here?“ I asked. ”Were you here?” the woman asked me, laughing. ”No. 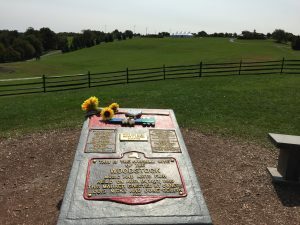 I was 8.” I wanted to tell them about the sleeping bags in the living room and hear the man’s story of his day at Woodstock but I’d had my time at the site and now it was time for them to have theirs. Like the night before at Big Pink, I knew it was time for me to leave. I reached into my pocket for a heart. Another red one, yes! I gave it to the man. He took it with a bemused smile and thanked me graciously. “Enjoy your visit!” I went through the hedges and got into my car. My GPS, apparently fully recovered by now, was telling me that I’d get home at 5:30pm. I didn’t want to deal with DC rush hour traffic so I started thinking about stopping to get some lunch. I could also spare some time to stop at the New Age-y shop I’d passed on 17B for a woo-woo souvenir. I headed back toward Monticello and got there without having seen the shop I was looking for. Oh, well. Not meant to be. I had seen a sign for Tilly’s Diner, so while I stopped to fill up the gas tank I looked it up on Google Maps. It showed me the location where I already was. Oh, great. GPS is on the fritz again. But then I looked up there was Tilly’s, right across the street from me. I sat in a booth and ordered breakfast for lunch. 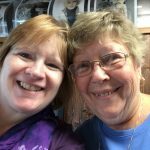 The diner had a friendly, family vibe, more so than the Liberty Diner. For example, a customer passed by my booth at the same time as my server and both women stopped right there to chat cheerfully. It became quickly clear that they were cousins. Um, ok. “Well, this is for you, then.” I put the other heart that I was going to give her after Anne’s back into my pocket. Her cousin brought my food out just then so Marjorie gave me a smile and went back to her own table. A little while later I was spreading the last of my eggs over easy on my rye toast when I felt a tap on my arm. It was Marjorie. “I ‘stole’ the idea from someone else, so go for it!” I gave her some heart-buying tips. She was grinning from ear to ear, very excited to start handing out her own hearts. We chatted a little bit. Marjorie told me she’d lived in Monticello all her life. She had just attended her 60th high school reunion over the weekend… at the Woodstock site. Marjorie’s husband signaled he was ready to leave. We hugged again and she left. I left shortly after. It was time to go home.